Marc shares some of the events that happened on this day in history, including the death of Rachel Corrie and the My Lai massacre. That was Rachel Corrie speaking about hunger when she was ten years old. 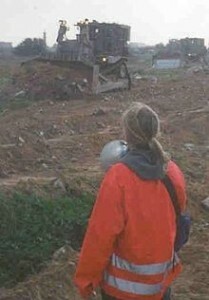 On this day in 2003, when she was twenty three years old, Rachel Corrie was crushed to death by an Israeli army bulldozer in Gaza. She was in Palestine with the International Solidarity Movement, an activist group that sought to use internationals to disrupt Israeli violence against Palestinians. She was standing between Israeli soldiers and a Palestinian home that they were trying to demolish when she was run over and killed. The My Lai Massacre took place today in 1968 when American troops during the Vietnam war entered the tiny village of My Lai and killed 504 Vietnamese villagers, men, women, and children, all innocent civilians. Though 23 soldiers were indicted only Lt. James Calley stood trial and was convicted. None of his superiors were ever held accountable. The only reason this came to the Army’s and the public’s attention was Warrant Officer Hugh Thomas who saw the devastation from this helicopter, saved as many of the Vietnamese as he could and stood between US troops and the Vietnamese to stop the massacre. On this day in 1821, Thomas L. Jennings became the first African-American to receive a patent for an invention. Mr. Jennings was issued a patent for a dry-cleaning process known as “dry scouring.” An activist for the rights of African Americans, he served as Assistant Secretary of the first annual Convention of the People of Color in June 1831 in Philadelphia. What the last state to ratify Thirteenth Amendment that abolished slavery in the United States? And when did it happen? Well, it was Mississippi and it happened on this day in 18, no, excuse me, 1995. On this day in 1827, the Reverend Peter Williams founded the nation’s first Black newspaper, Freedom’s Journal, in New York City. He hired John Russwurm, leading abolitionist and founder of first Black Presbyterian church as Editor, and as junior editor Samuel Cornish, who founded the Haitian Emigration Society that urged free Blacks to move to the first free Black nation of Haiti in 1804. Freedom’s Journal was published for the 300,000 free people of color who lived in the North and to counter the vicious racist nature of most American newspapers. And on this day in 1935, African American scientist Dr. Percy Lavon Julian synthesized the drug physotigmine, which is used today in the treatment of glaucoma. Born in deeply racist Alabama and suffering huge indignities on his way to his PhD, Julian later headed the soybean research department of the Glidden Company and formed Julian Laboratories in order to specialize in the production of sterols, which he extracted from the oil of the soybean. Perfected in 1950, the method eventually lowered the cost of sterols and ultimately enabled millions of people suffering from arthritis to obtain relief through the use of cortisone, a sterol derivative. Here’s a song to think about on March 16th. It’s a song by a Philadelphia based singer who began her career as a member of James Brown’s revue, where she sang before briefly signing with Checker Records and then joining Motown. She is best known for her collaborations with Marvin Gaye, with whom she scored seven top forty hits in just three years. Her career was cut short when she collapsed into Gaye’s arms during a show in 1967. She was diagnosed with a brain tumor, and though she had eight operations for it, she died on this day in 1970 at the age of 24. I’m talking about Tammi Terrell, and here she is with Marvin Gaye singing Ain’t Nothing Like the Real Thing.